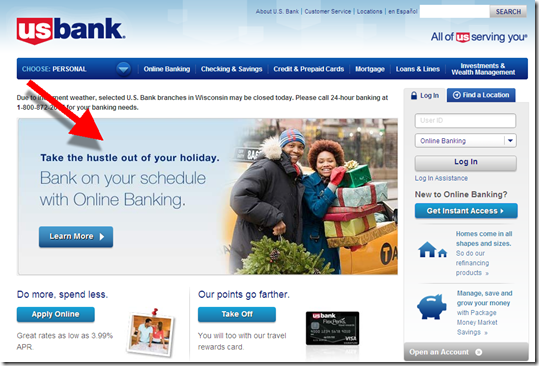 A few months ago I received an email (above) from US Bank where I’m a long, long-time customer. It was a simple request for my opinion on the bank’s products and services. I was slightly put off by the wordy intro, which concluded with a 31-word sentence telling me how important my opinion was. But that’s just the editor in me. As I was about to press the Begin Survey button, I noticed that I was about to enter a 25-minute questionnaire hell. That was all I needed to know, I left it undone and went on to other things. Twenty-five minutes! That’s just too long for any normal customer. Ideally, keep online surveys to 5 minutes at most or you risk losing the attention and thoughtful answers of your respondents. If you really need a half-hour of your customers’ time, provide some type of thank-you gift, even if it’s just a chance to win $500. Otherwise it’s almost insulting to ask for that much time with no reciprocation. Bottom line: While you are not going to lose customers with a lengthy survey, you probably won’t get valid results due to so many dropouts. But you most certainly will irritate a good portion of the recipients. Don’t do it. Early on in the smartphone era there was a debate as to whether native apps or the mobile web would carry the day. As an early iPhone user, I was solidly in the native apps camp. Some day there will be a better interface, but until then it’s an app world (though not every headline writer agrees). And now the question for financial institutions is not whether you need a native app, it’s how many do you need? Until recently, most financial institutions hoped to have a one-size-fits-all mobile app, just like on the desktop. That’s the option that lowers development costs, simplifies tech support, and makes digital banking easier to manage. But since most financial institutions serve many customer segments, bundling too many features into one UI really gums up the overall experience. So we are seeing more and more financial companies developing multiple native apps to support distinct business groups, customer segments, and even charitable activities. The most prolific? US Bancorp with 43 iOS apps alone, 28 of which are white-labeled for its affinity credit-card customers (see screenshot above). Delving deeper, let’s look at the 25 most-popular free finance apps in the U.S. Apple App Store (data is from mid-March, when I started this post). The 13 financial institutions in that group have a combined 123 apps, for an average of nearly 10 per bank. However, excluding US Bank’s 28 white-label apps, the total is 93, or 7.2 per FI. 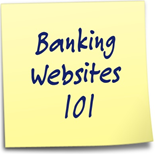 There is only one reason I visit a bank’s website: to learn about its online and/or mobile banking features. Granted, understanding digital banking is my livelihood. But normal people looking for a new checking account, credit card or loan also need to understand digital capabilities. Even for those that need the comfort of knowing there’s a branch nearby, online/mobile is still a key attribute for the vast majority of consumers, and businesses, shopping for banks. Plenty of smaller banks and credit unions are already showcasing their digital features. 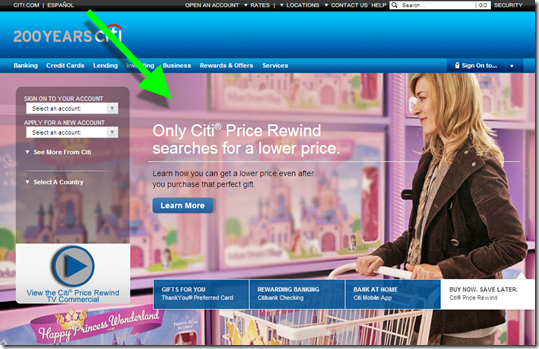 For example, San Diego County Credit Union uses “Online & Mobile Banking” along its top navigation. 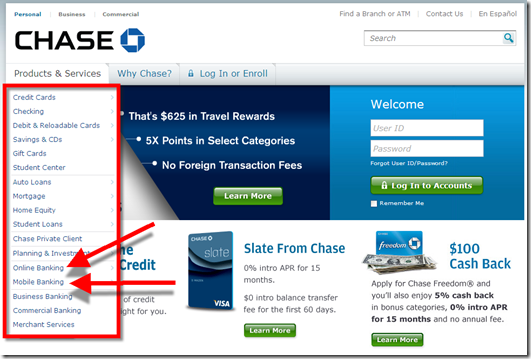 Just about every bank has an obvious login button in the top-right or top-left corners (or Chase who has it plastered in the middle). That’s fine for existing customers. But what about those simply shopping banks? You would think that online/mobile capabilities are pretty important to someone checking you out online! The big-four U.S. banks do a good job exposing online and mobile features. 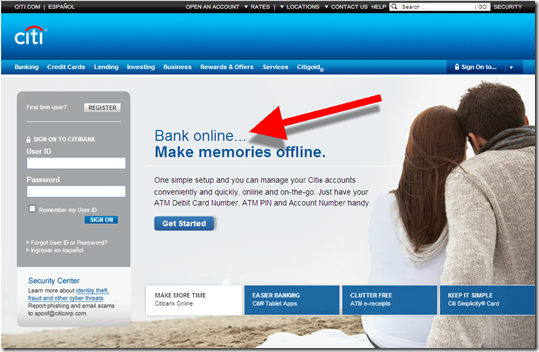 Citibank is especially focused with its “bank online….make memories offline” tagline mid-page (screenshot below). 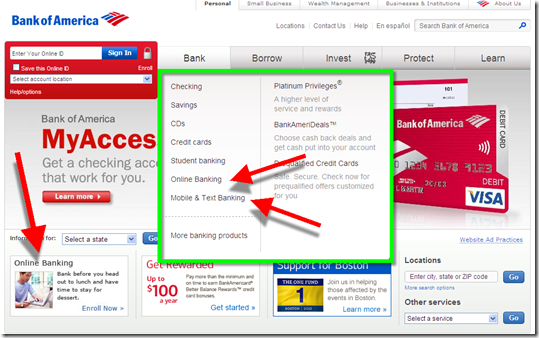 But finding the online banking features often requires menu hunting (see BofA, Chase, and Wells below) and/or promotion scanning (see Citibank, Wells and Atlantic Regional FCU below). 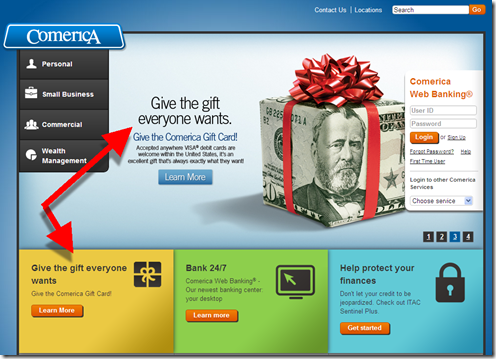 And sometimes, it’s below the fold (Sterling Bank, BECU) or a screen away (see Comerica below). Bottom line: You don’t want to get too cute with the fundamentals. 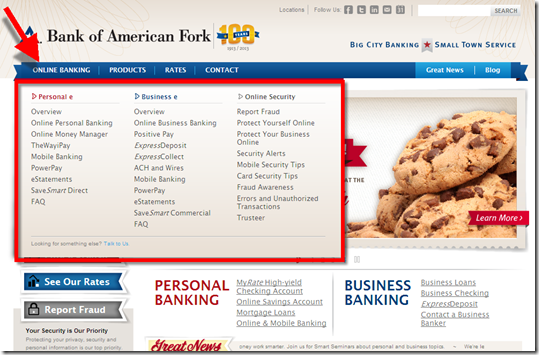 That’s why we like the direct approach of both U.S. Bank and Bank of American Fork who position Online Banking as the first tab in their primary navigation (screenshots below). 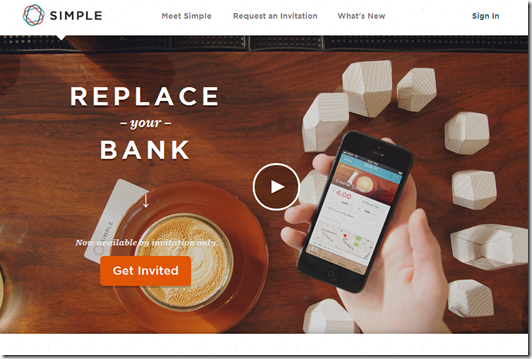 Alternatively, startups Moven and Simple use page-dominating screenshots of their mobile app to position themselves with mobile bankers (see below). No, that’s not a typo. This community bank blankets American Fork, Utah, with its 13 branches. It places online banking in its own tab, plus it launches a huge mega-menu detailing all the personal and business online and mobile features. (Plus it has cookies, the kind you eat, in one of the four rotating promotions). 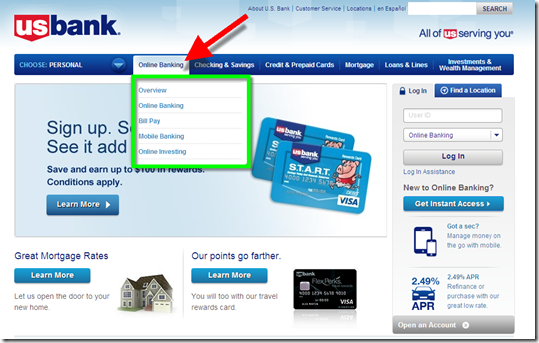 US Bank is the only one with an “online banking” tab. And it’s positioned in the pole position. Mobile banking is listed in the mega-menu. While it’s not in the main tab, both online and mobile are mentioned on mega-menu displayed when you hover over the “Bank” tab. 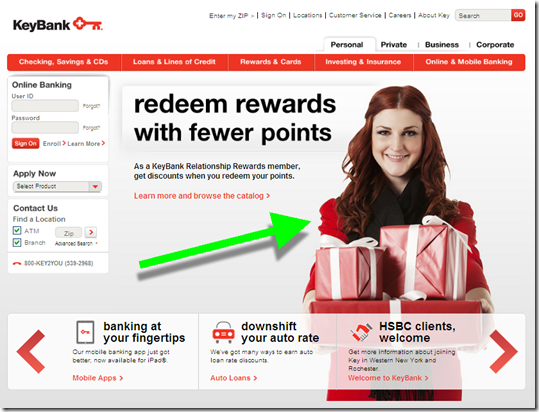 And there is an online banking promo in the lower left. Similar approach to Bank of America. However, online and mobile are buried pretty far down the popup mega-menu. Citi does not beat around the bush. 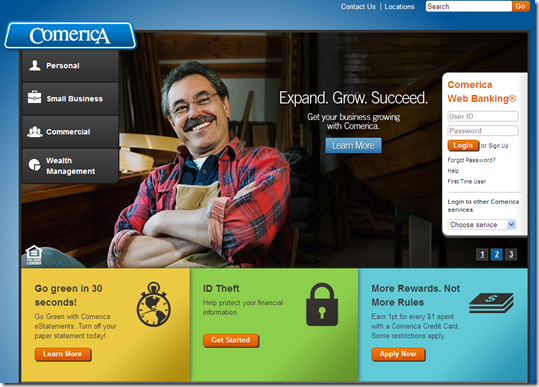 Their entire homepage is devoted to driving users to online banking (first screenshot). And those that launch the mega-menu, see online banking, billpay & Popmoney at the top (second screenshot). However, the bank has no mention of “mobile” anywhere. 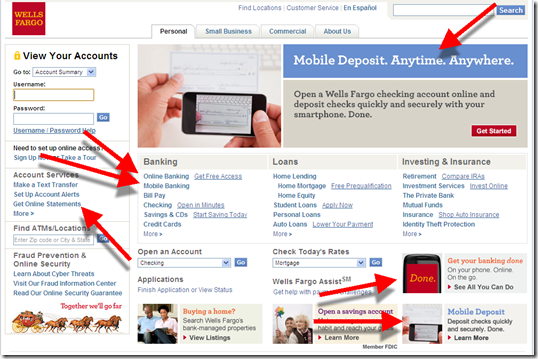 Online & mobile have the top position under “Banking” on the homepage. In addition, there are promotions and links scattered about the homepage. 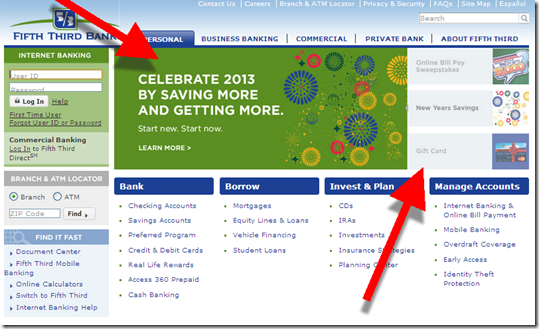 If you don’t have online banking in the main nav, you need to compensate elsewhere. Atlantic Regional’s BancVue-designed site uses the fashionable full-page graphic to draw attention to its four rotating promotions. Number 2 leads shown below leads directly to online banking info. The CU is also running a mobile banking announcement across the top of the page. Simple turns the double-play with an excellent welcome video and a snazzy shot of its iPhone app in action. 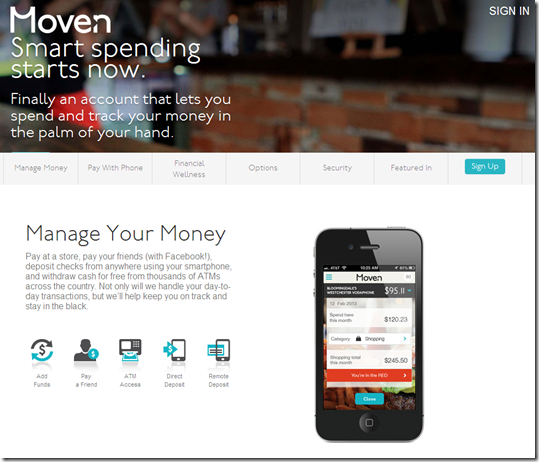 Moven is all about the mobile, and visitors can’t miss that with the page-dominating visual. 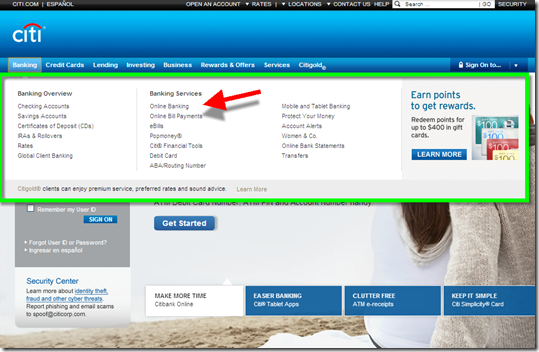 The bank currently has no mention of online banking on its homepage. 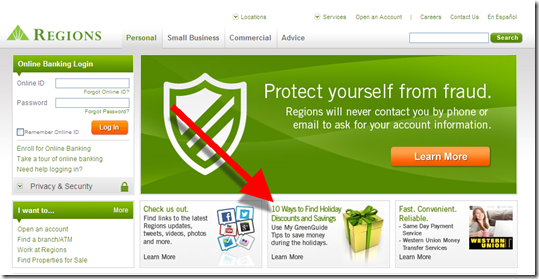 However, once a visitor goes to the Personal or Small Business page, it is listed on the drop-down mega-menu. 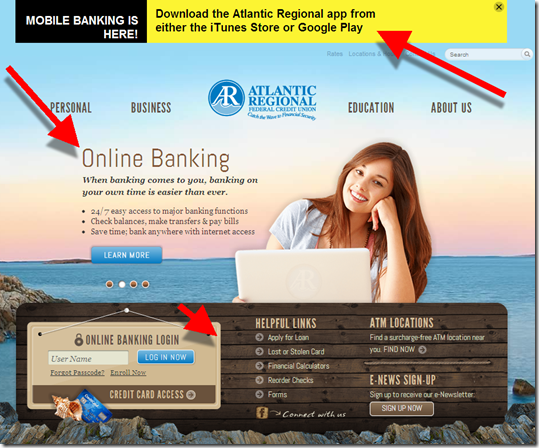 Note: We cover financial website and mobile design issues periodically in our Online Banking Report (subscription). In my annual look at holiday offerings from major banks, I found that Scrooge still roams the halls at many of the big names. 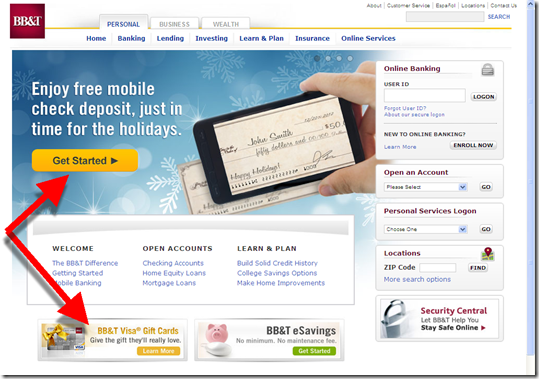 Only eight of the 20 largest U.S. banks are using holiday-themed promotions or graphics (note 1). That’s one more than last year, but still two less than 2010. 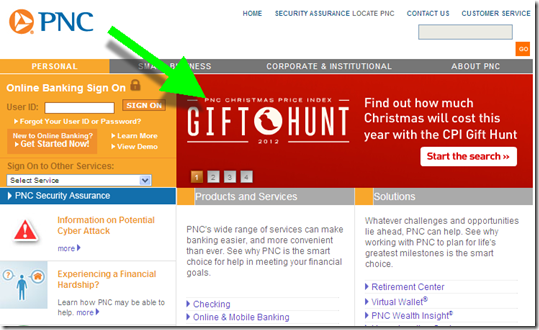 As usual, PNC Bank is the exception with their two-decade long holiday CPI (Christmas present index). BB&T, Comerica and Fifth Third are also festive this year with gift card promotions supported by seasonal graphics. 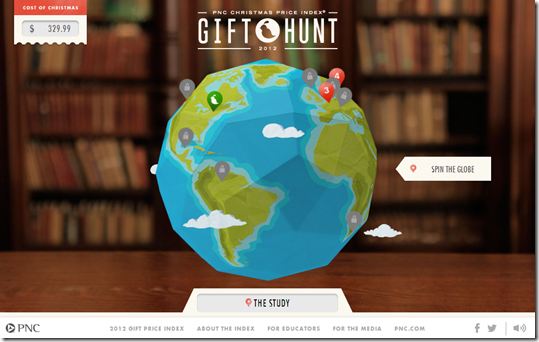 And US Bank, Citi, Key and Regions Bank used some holiday imagery. Following is a quick overview of the promotions, including a 1-to 5-bulb rating.